It was a few days into our latest European campervan trip when it truly dawned on me that this would have to be one of the best ways to travel. I was sitting outside our motorhome a glass of chilled Bourgogne Aligoté in my hand, under the gaze of a chateau and generations-old winemaking business. We had just purchased this wine, (and a few more) in return for a private tasting and tour of their operations. As if this scene couldn’t be made any more perfect, my view on the other side was of a small lake on the chateau’s sprawling estate. Weeping willows swayed in the breeze on the water’s edge, where a small wooden boat patiently awaited its next passenger. It’s official. Travelling through France in a motorhome is the best! In the Alpes-de-Haute-Provence, we ate olives harvested from our host’s grove and indulged in the most amazing confit d’oignon I had ever tasted. All of this was made on site at the farm. In Grasse, just a little north of the French Riveria town of Cannes, we sampled local cordials, nuts and olives, proudly presented to us by owner. In Dachstein up in the French Alsace region, we couldn’t get enough of the white asparagus, duck rillettes and olive tapenades. We’ve eaten duck confit in the south-west of France and incredible calvados in the north. There’s been way too much wine from so many small vineyards all over the country and enough fresh produce to keep us constantly fed. It’s the perfect way to end a day on the road in France. Whenever we pulled up for the night, you could find us having a conversation with a farmer, a shopkeeper, or a winemaker, and taking some of their goodies back to our mobile home. Most times, it also included a bottle or two of their finest. Oftentimes, I’ll find the family dog to play with or their kids who like to learn English. It didn’t seem like much of a hardship at all really. We got to satisfy our love of food, learning about how it was made or where it came from in the process. In return, the owners got a few extra euros for giving us access to their property for an overnight stay. It seemed the least we could do really! This is the world of France Passion and motorhome stopovers in France. If you’ve never driven a campervan or motorhome in France, then the chances are you’ve never heard of this. Or, you’ll incorrectly jump a few paces ahead and think I’m about to reference something a little racier! 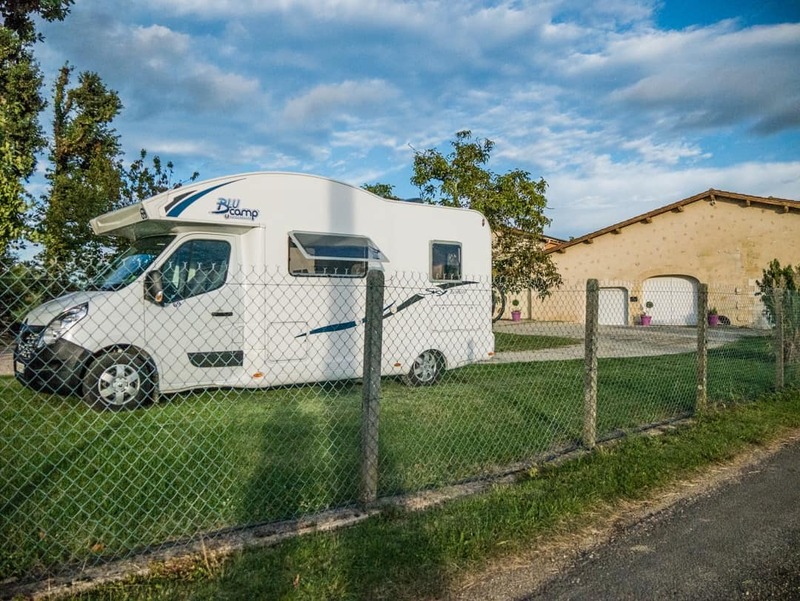 France Passion is a network of properties dotted all over France, where landowners have agreed to allow campervans and motorhomes to be parked on their premises overnight, for free. From winemakers to olive growers, to poultry farmers and artisanal products, it is a network like no other. Slowly, some other European countries are trying to emulate this. I can only say that if they are successful, their country will be all the better for it. It’s effectively free wild camping for motorhomes. There can be a great struggle sometimes between “free camping” and the potential for people to not treat their environment so well. By having a network such as this, it provides a cheaper option for those who can’t afford to pay sometimes exorbitant prices in official campgrounds. At the same time, it provides a safe, clean and hospitable environment where motorhomes are truly welcomed. For us, we choose to stay in such locations as they are quite simply the best. We don’t like parking in a space where there are heaps of other motorhomes. We don’t particularly like queuing for facilities or having to walk across a campground to get to them. We love the experience of being as local as we possibly can, eating locally and speaking with the owners. We’ve had so many great experiences in this way. In return, the motorhome community can support a network provided solely for them and can give back to the local community and its economy. I have never, ever been to a France Passion site where a previous motorhome has left the area in a condition other than what they found it. Contrary to many opinions, those who choose to travel in motorhomes aren’t there to destroy everything around them or to leave a mess. After all, the majority of motorhomes are fully self-contained. The France Passion map below shows just how many locations there are. It’s mind-blowing! Each dot represents a property where you can stay overnight in a motorhome. There are over 2,000 locations in France, offering over 10,000 parking spaces. The colours are to differentiate between the type of property it is. This way you can find somewhere to stay in your preferred location and also your preferred type of producer eg winery. If this doesn’t tempt you, then the incredible offer of being able to stay overnight for free would surely be the determining factor. That’s right, there is no obligation to pay for your stay. It is however encouraged, and I would say, courteous, to go and say hello upon your arrival and at least have a look at what they have on offer. In a world where nothing is for free, France Passion is a one of a kind standout performer. Personally, we found it impossible to walk away without buying something, but this type of arrangement speaks directly to our hearts. Food and travel are a match made in heaven for us, and to allow us such direct access to these local producers is more than we could wish for. Giving money directly to the producer is also something that we don’t experience so much anymore so it’s wonderful to be able to do this. On most occasions, my French and their English came together in such a way that we were able to communicate effectively. I’m really great at speaking “food French”, so in most cases, I had it completely under control! France Passion hosts offer a basic service of a safe place to stay overnight. They aren’t like official campgrounds that offer water, electricity and wifi. With so many different producers on offer, we made a pact to try and experience as many different France Passion sites as possible. Depending on the area, it can sometimes be overloaded with one particular type. Obviously, if you are in the Champagne region, winemakers will make up the majority of France Passion locations, the same for Burgundy. 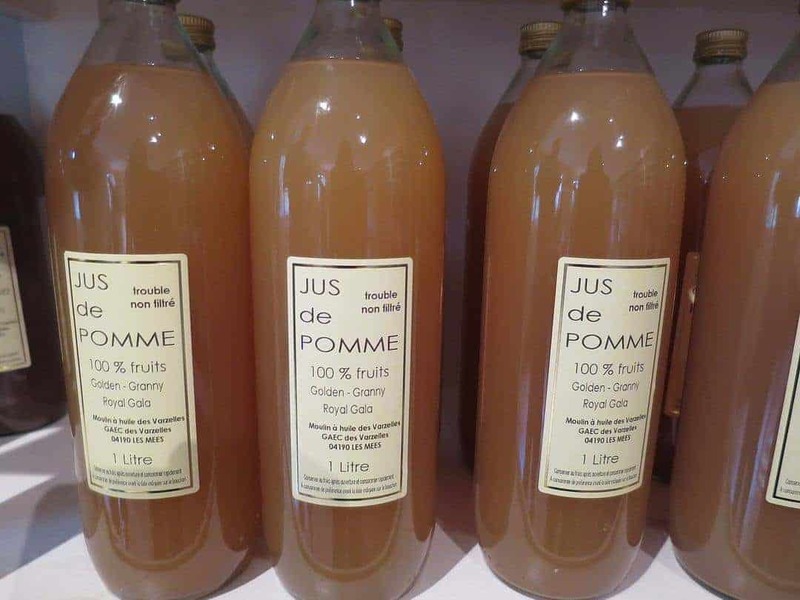 Whilst up in the Normandy region, there will be an abundance of apple cider producers, and in the regional areas of Provence, olives and fruit. Here are some examples of France Passion stopovers. Chateau de Premeaux takes out my award for the most beautiful France Passion location on this trip. The chateau and its winemaking business has been held in the same family since the mid-1700s. Délices de nos Campagnes in Givny was a working farm and probably not for the faint-hearted. If animals, and all the noises and smells that go with them are not your style, best to avoid this one. We loved exploring the areas full of noisy guinea fowl and cows that lowed gently all through the night. The owners here, being heavily involved in the farming activities, were less interested in us, preferring to stay aboard their tractors and give us a simple wave. In the village of Les Mees, we hit a jackpot of a different kind. Nestled in amongst apple trees and an olive grove, Moulin des Varzelles offered us a sanctuary of total peace and quiet. So tucked away, this is a location that could only be found using a GPS. Upon arrival, we visit their shop, where the matriarch of this olive oil producing farm uses a cash register that looks like it hasn’t been replaced since 1980. It’s all part of the charm. The confit d’oignon is one item that just doesn’t seem to last very long! Before long, we’ve set up our table and chairs in amongst the olive trees. Sunset over the famous Pénitents des Mées rock formations ended the day on a high note. At Espace Terroirs at Grasse, we learn about the sirops et confit de fleurs de Grasse that are something of a speciality in this area. Grasse is known as the perfume capital of the world, with a thriving industry here since the 18th century. The floral scents of the perfumes are also used to infuse sirops and make for an unusual drink. The owner, Abdelhamid Ksibi, had placed a small cup of coquelicot sirop into our hands the moment we entered his little shop. Coquelicot is French for poppy and although sounding like quite a strange flavour to have in a drink, it was surprisingly refreshing, and I walked away with a bottle of it to bring home. Outside, I am, as always drawn to the local animals. This time, some resident geese had caught my attention. Auberge Margot & Jean Martin at Petit Ballon offered yet another France Passion variation. Whilst providing several places for campervan parking, in the stunning Alsace region, it also was home to an auberge. Family owned and operated, we had a fantastic meal at this restaurant. Foie gras was the prime feature at Ferme Plume d’Or, 30km outside Strasbourg. Here geese were being farmed to make the French delicacy. Plenty of honking here so not one for those who hate noise. The attached produce store here was very professional, and we spent way too much time in here lingering over the food and discussing it all with Astride, one of the owners. They can be found all over France. Stopovers for up to 24 hours are free. Be part of a unique experience. You can experience and learn from different environments that you would not ordinarily be able to (working farms, the operations of wineries). More freedom and serenity than in an official campsite. They can be found in some stunning locations throughout France. Buy produce and wines made by local producers. Safe environment for you and your motorhome. I don’t really think anyone should be surprised at these, as they should be common sense. The one thing I do love is the general courtesy extended by those who travel in campervans. It’s rare on the road or in campsites to see people behaving badly. Make sure you have a current France Passion guide. Whilst many of the hosts have stayed part of this network for many years, some come and go. Having a guide makes sure you don’t spend the night on someone’s property when they aren’t a current host. Sometimes booking or phoning ahead is necessary. Check your guide to be sure prior to arriving. Don’t arrive in the middle of the night. In the guide, there are key details relating to each host, including arrival times. This is particularly important for working farms, where they might be out in the fields operating equipment if you arrive in the middle of the day. Watch out for periods of closure. Vineyards, for example, will normally not take guests during the harvest season. Do make yourself known and say hello. These people are opening up their homes and land to you for free. It’s the least you can do. France Passion provides a stopover site for the night. There are no services attached. Campervans are fully self-contained making this the perfect arrangement. Be sure to take everything, including your rubbish with you when you leave. Don’t touch things you shouldn’t. Whilst the people we visited were more than happy for us to walk around their farms, I’m sure they wouldn’t have been impressed if we sat on their tractors or annoyed their animals. When in doubt, always ask. Say goodbye when you leave. Depending on the circumstances, it could be a conversation or a wave as you pass them by in the field. Be quiet and mindful of others who might be staying there too. Where can I buy the France Passion Guide? Travellers can buy the annual guide online from France Passion. It is only available online. Once you purchase the guide, you will also get access to their online portal where everything in the book can also be found. It is a useful planning tool. Or, if you hire from France Motorhome Hire the guide comes with your campervan. Quite often we had a France Passion location in mind, but a change of route during the day meant we needed to find another. Having the guide became an invaluable tool to have at our fingertips. On the website, there is a search function that allows you to search by region or department. 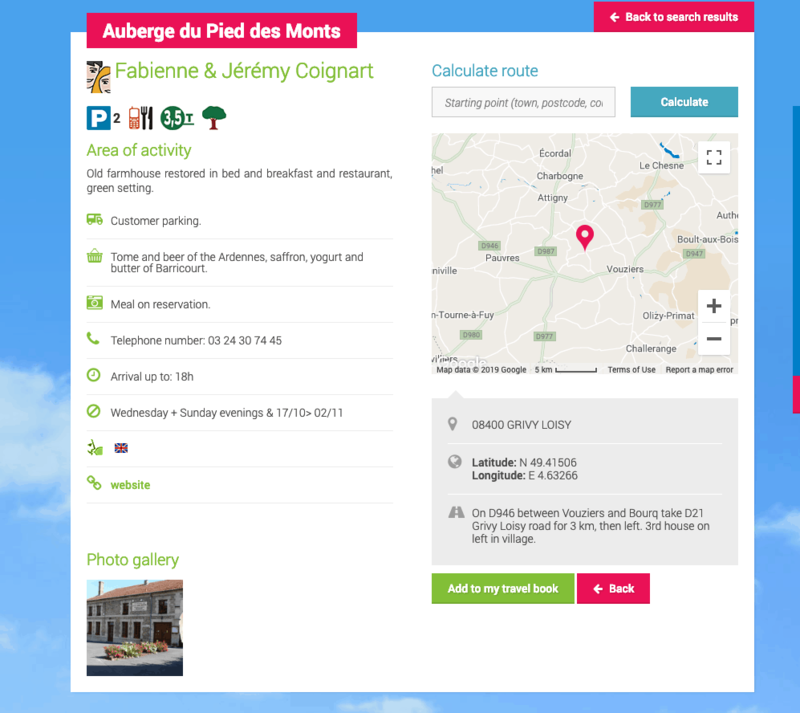 Additional search functionality includes the type of property, availability of a restaurant, large motorhome accessibility and languages spoken. The website can be read in English, French and German. Once the search has completed the results will show as indicated in the image below. The circle with a number represents the total number of properties in the area selected that are available. From here, simply click on the circle to provide the next level of breakdown. Now you have a more dedicated split by area. Clicking on one of the circles here will now break it down further into actual properties, allowing for a more specific area to be identified. At all times, on the right-hand side, the list of properties will appear, which can also be clicked on. In this screen, clicking on the red map marker will take you to the actual property. You can now see that out of a possible 38 motorhome stopovers, I’ve now been able to isolate it down to just one. At this stage, I can now see the name of the property (Auberge Di Pied Des Monts) and the location 08400, Grivy Loisy. We see the host’s name (Fabienne and Jeremy) and the type of property it is (saffron, yoghurt, butter and beer). There are two parking spots available at this location and arrivals must occur before 6 pm. It is closed on Wednesday and Sundays between 17 October and 2 November. There are phone numbers, a website and English is spoken. The address details and coordinates are also provided. All of this information can be found in the book, it is just a more manual approach to finding a property, and without an interactive map, you don’t always get the location as close as you might like. Becoming a member offers a range of other features as well as being able to use the online portal to search for locations. You can also do online trip planning and save a record of your planned journey. Here you can also look for France Passion locations in advance and plot them onto your itinerary. The mapping tool also allows for route planning. There is also an events calendar where you can look ahead at the areas you plan of visiting to check for festivals etc. These sites represent only a handful that we stayed in. We had so many great experiences in these free campsites in France for campervans. I would strongly recommend France Passion to anyone travelling in a campervan throughout France. Not only will you meet some great people in some terrific locations, but you will save money as well. If you’ve stayed at France Passion sites, I’d love to hear some of your stories too. What a great experience, to stay on private properties and sample locally produced foods! I love to camp, so this would be amazing…thanks for sharing all your tips! This sounds amazing! I spent just about a week in Normandy this summer and am already plotting my return next year. Doing it by camper van would be even more awesome! I’ll definitely keep this in mind. Sure you would love it Amy. Woah, this is awesome. More people should definitely know about this, 74.2x better than staying in a silly gas station! What interesting and helpful article. You’ve really had a great experience! This is such a great idea, I wish there was one of these for campers! Oh this is so cool and really a great article! We might try this out someday! Wow! I hadn’t heard of this before, but I love the idea of it. You definitely don’t need power, water, etc. every night and what a way to save money. Great article. Very interesting article! Seems like such a cool experience! This sounds like an amazing way to travel! So much more authentic than usual campsites and then you also don’t have to pay! We would love to have a campervan one day and do something similar! Never been camping like this.Thanks for the tips. Of course, you can voice your opinion however you like. I simply stated that if it were not for the need to recharge, I would stay here forever. There were several France Passion locations that we stayed at that did indeed offer electricity and wifi. Personally I’m ok with this as I can still enjoy nature and the surroundings and have access to my wifi which doesn’t create any noise or issue with anyone else near me. Still, I didn’t say they should, I just said my business brain thought about it. Thanks for stopping by, appreciate you taking the time to comment. Thanks so much for this article. Sounds like an interesting adventure. This is actually flipping awesome. SUCH a good idea. Soooooo many great things about this. I can see why you’re excited – I’d be too!!!!! This is a great idea and I wish I’d known about it when I had my camper van. I love the idea of camping in a vineyard or an olive grove, although I would have to give the Foie Gras farm a big swerve personally (and not because of the noise). This sounds so awesome! We have been having an itch to do a campervan or even convert an old bus into a camper home for traveling the States. Now I want us to do this, what a great way to see France! Thanks for sharing such in depth detail and all your wonderful experiences! Wow! I had no idea about these campsites. Free stay for up to 24 hours is a brilliant way to see more of the French countryside on a budget. This is amazing! A great way to have a local experience and save money at the same time. I’ve never heard of France Passion before (likely because I’ve never traveled France in a camper van), but I was very surprised to see how extensive the network is. The quiet Moulin des Varselles sounds like a place I’d really enjoy! Yes Erika it really is extensive – almost feels like one in every town. I absolutely love this idea! The first time that I visited France, it was by camping. So I can definitely attest to it being a great accommodation option in this country :). The concept of France Passion is just awesome. I would definitely try this out. What a great idea. I’ve never heard of this network before. Sounds a fabulous way to explore France and I bet the owners are really interesting people to chat to. And I’d love to sample all that produce! Yes we were definitely lycky to be able to use this Kathryn. I’ll be honest … I’ve always scoffed at the idea of camping/campervans in the USA, but this actually sounds really cool and like a great culture exchange. I would actually love to try this out. I’m probably guilty of doing that with cruises 🙂 Thanks so much for taking the time to read and comment. I love travelling this way !! I’ve never heard of this network, which probably isn’t surprising as I’ve never camped in a campervan in France (but we camp in tents a lot). We’ve travelled in Australia in a campervan and often say we’d like to do it again but the cost is always prohibitive, with rental and site fees. This sounds like the perfect solution. I agree that meeting locals and eating/drinking local produce is what travel is about. I’m SO GLAD you linked this to #AllAboutFrance and I’ve already shown it to my husband (and pinned it) for future reference. Thanks Phoebe. It’s one of those things that you really only know about it if you’ve used it. Otherwise you don’t know what to search for or ask for. Awesome concept, never heard of this network before. (and there are so many locations available) Bookmarking this article for our next trip to France. Love this idea! It’s a cracker Lisa. Definitely highly recommend. Aoooaw little doggie so cute!! This is amazing I didn’t know about the Frane Passion Network. Def would be useful if we ever do this worldwide campervan tour! This is the perfect experience for me, except I want my own caravan and haven’t got one yet. In the next few years I hope for us to have one of our own so we can go on adventures such as this. I’ve also pinned this and followed you. Great post! Thanks so much Suzannah. Hope you get your own special caravan – such good times ahead. My husband is a campervan fan. And it looks like there are so many things to take in consideration when traveling like that. But it is also great to hear about this network and the multitude of hosts available. Oh, and the dog you met is really beautiful! What an amazing way to explore the country and stay in some very unique places, I would love to do this someday and do the same trip, but not all those locations. This honestly sounds amazing! I would totally be down to visit some of these gems around France. I just need to get a caravan and my boyfriend to agree haha. That’s amazing such a cool concept! I love the variety in locations as well. Thanks for sharing this. I love this idea of camping, because you can connect with locals so much easier. This is so awesome! We have something similar in the US called Harvest Host. Staying overnight at a winery – now that’s the perfect camping spot! Harvest Host, thanks so much for that tip Bryanna. I shall be sure to use them when next in the US. What a brilliant idea! I just returned from a weekend trip to France’s countryside and I would have loved to find more places where I could have bought French products. I am a foodie and I had to come back with a lot of confits and cheese and foie gras. I think the entire experience of camping in a farm where they make local products is amazing, especially when it’s free. When I return from France I always have a suitcase of food with me but we can’t bring cheese back in. Wish I could ! I really enjoyed reading about France Passion. It sounds like a great way to meet locals and enjoy the countryside at your leisure. Wonderful! thanks Christina, I just love it. This seems to be a great experience. Being able to spend the night in a safe and welcoming place like a private farm sound very good to me. Besides, the fact that you can buy fresh products directly from the owners is also awesome. I will definitely consider France Passion for my future travels. Looks like France Passion has covered the whole country. I have never Camper-vanned ever, but by the photos, the places look very inviting. This is really cool! I wish I would have known about this a few years ago haha! We’re doing our first motorhome trip to France in a couple of weeks (hired). I’d not heard of this, so thanks for the article. Did you alternate with “normal” campsites so that you could use the facilities for filling and emptying or are there enough municipal aires etc? No you can only buy it online if you want the membership and book. If you hire from France Motorhome Hire, I know they include the book in their hires. We tow a motorcycle trailer with our Motorhome would this be permitted? Can’t find a reference to this on the FP site. Hi Simon, I don’t believe this would be an issue. If you are a member of FP and are in a motorhome, no problem. I’ve seen someone with a trailer with mopeds before. The only issue would be on a case by case basis if it happened to be a really small site. Great read very useful.. we have a campervan and seriously toying with buying a motorhome, one main concern is finding suitable parking near the village for the motorhome… love the idea of the Passion site which aren’t currently an option with a campervan as we are not self sufficient. Would you be able to stay at these places with dogs? We travel with our dogs. We have two. Hi Ann, it would totally depend on the owners and also the type of location it was. I imagine those that have livestock might not allow in some circumstances, but others who are agricultural farmers or producers might be ok. I have seen dogs on site before, but they have been small dogs. Not sure what type you have. If in doubt, just phone ahead and ask. I think this option may be in our future! It has always been a joke between my husband and I that we would do this upon retirement. I think I would definitely get onboard with doing it in France. I always see the campers in Europe and pulled over with the most incredible backdrops, must be such a wonderful experience! Ok you sold me! Thanks for sharing, it has definitely inspired me to consider this sooner rather than later! It really is the best! We have been doing it for so long now in Europe that we are comfortable staying in so many places. It means we get to see such beautiful spots that aren’t populated and no-one would ever know we are there.